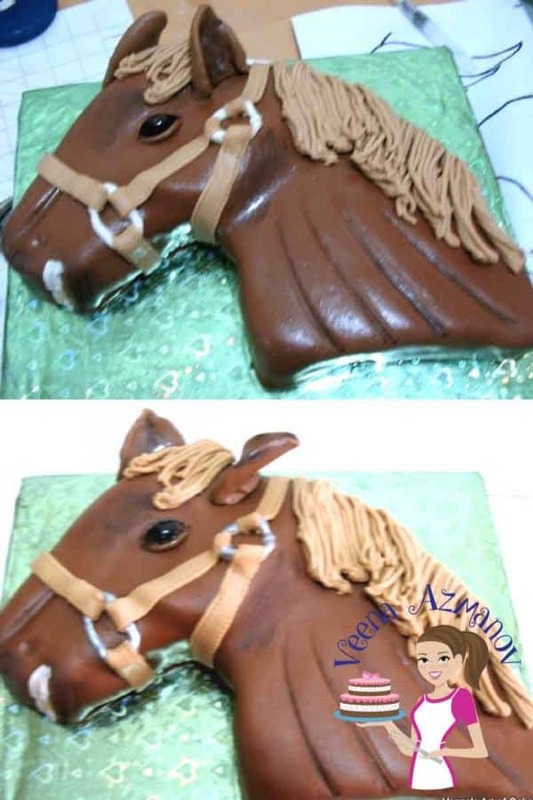 A simple horse cake can make a great birthday cake for a kid or adult who loves horses. Simple, easy and effortless and you don’t have to be a professional cake decorator to accomplish this. I recently made this 2D Horse Cake for a friends boyfriend. She wanted something simple that would fit her budget but also have a wow factor. Since her boyfriend loved horse riding we thought what better than a Horse Cake. 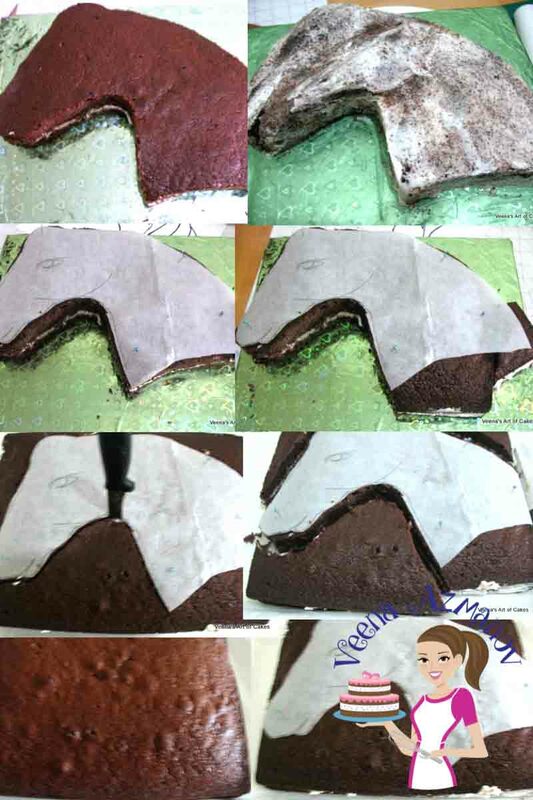 We chose 2D of course to keep the cake in her budget.. And I thought since it was so simple I’d make a basic 2D Horse Cake Tutorial for beginners. Well, as always, I took pictures of the process so you can see what I did. Now I’m not going to explain much but you’ll see that it’s all fairly simple. 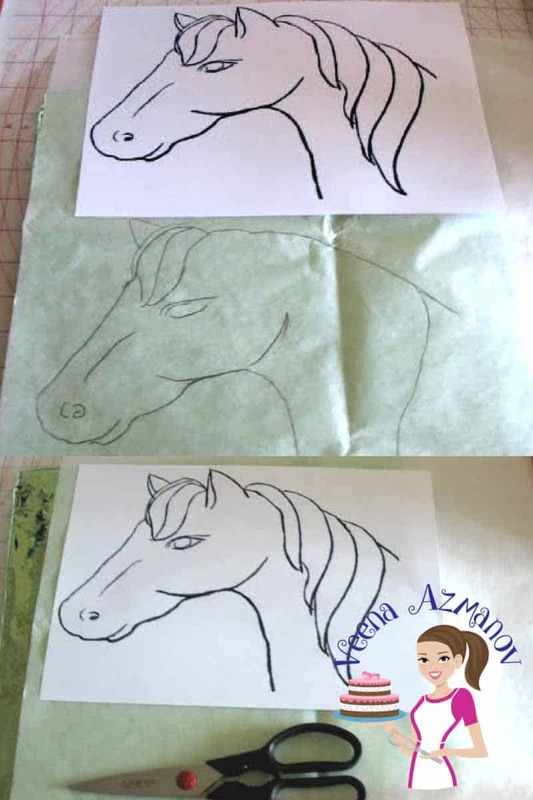 First, go to the internet and find the picture of the horse you want to make. You could use any picture with the same technique, a another animal or character. Exactly the same technique. Search for coloring pages and you will get a picture which gives you an outline. Print it in the size that you want so you trace it. If your cake is big you may need to print your picture into parts on different pages then use tape to line the pages so you have a bigger image. For example In this case -you may print the head on one paper; the body on another and the bottom on another. What’s important though is to make sure your increase the image size by correctly as one whole piece so all the parts are in proportion when you tape them together. Trace the paper on a piece of parchment paper then cut along the outline. Now you should have an image the size of your cake. Layer your cake and fill it with frosting / buttercream. Do not level the top. You can leave the top to add more definition to you cake. Its best to freeze the cake for an hour so it’s easy to carve. But since this is a fairly simple design I just froze it for about 30 minutes. Freezing the cake makes carving much easy as you cake will not fall apart. Place the picture on the cake. Try to adjust as best you can. But sometimes you will need to trim in parts. You see here a part of my picture does not fit… don’t worry you can take care of that later. I use pins to secure the picture in place and cut around it. Hold the knife straight not at an angle or you will get uneven sides. Use an up an down motion, and be gentle. Now start separating the parts carefully. Now use the spare cake to add any missing parts. Now take the parchment paper off. Your parchment paper will still be used to ensure you place the eyes and ears and other parts in the right position. You can leave it like this, go ahead and add fondant to the cake. Or you can add more definition and character to your cake. Using the spare cake, I added a chin, a cheek and a forehead. I cannot tell you how to do this specifically because you work on it adding and subtracting until you are satisfied. Add another coat of buttercream then cover with fondant. Roll your fondant and place it on the cake. Make sure you ease the fondant into the curves of the cake slowly without tearing it. Now start adding definition. Use your fingers to smooth the fondant. 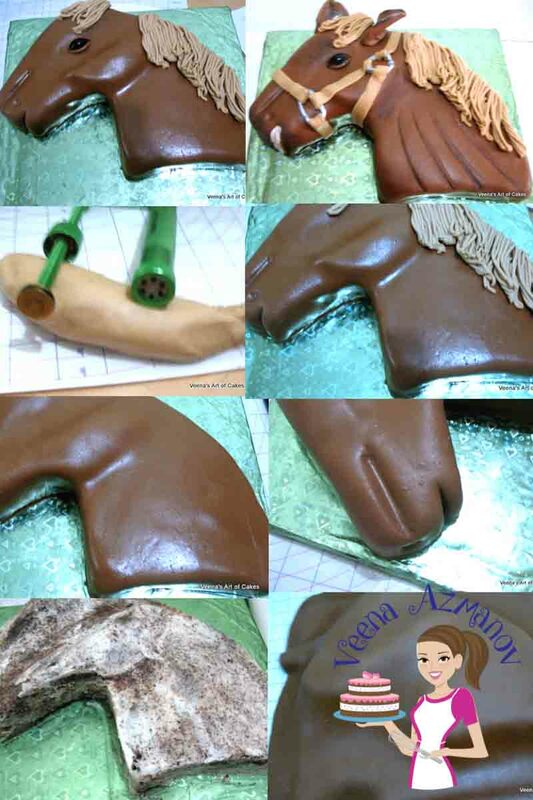 For the mane if you do not have a gum paste extruder use a clean garlic press and very soft fondant. I have a gum paste extruder so I used mine with this disc. It’s the second largest disc I think. Now start adding the mane until you are satisfied. Now for the eye, I used my brown fondant, shaped it free hand and placed it on the cake. Use your template to guide you in positioning it. Then I took black gel food coloring and highlighted the center. For the reins, I used the lighter color fondant than the mane and the stitching tool below to add the marks. OK, no laughing….. but I placed the ears wrong at first. Can you tell…? I didn’t realize until my husband pointed it out. I thought it looked funny so I kept adjusting the shape, wondering why they didn’t look right……ha.. sometimes when you look at something for so long you – you get used to it and can miss the most obvious..makes sense? I added more definition to the horse such as these lines. (what do you call them?) and I smeared some black gel color around his cheek, chin, forehead. Not necessary but does give it that masculine look.. I think! Can you see the ears placed wrongly? The top one is right lol!! ha!! Love Cake Decorating ? 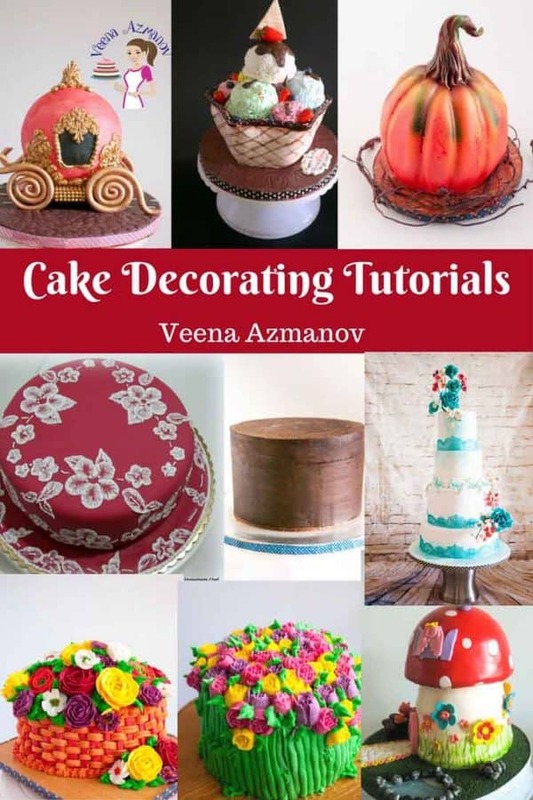 Click here to go see the whole collection of Cake Decorating Tutorials from Basic to Advance. Hey Sharon. I think this will be enough for 20 to 22 servings.